The Brandt Hydrotherapy Armchair #20002 is made of black vinyl covered seat and back mounted on a chrome steel frame. Designed for use with leg and hip tanks to facilitate treatment of the lower extremities. Constructed so the legs of the chair straddle the front end of the tank permitting the seat to be positioned just above the tank rim. Has safety belts and is supplied with crutch tips. 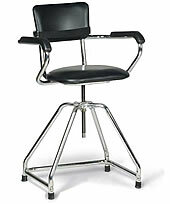 - Color: Black vinyl covered seat and back, chrome steel frame. - Width inside arms: 20-1/2"